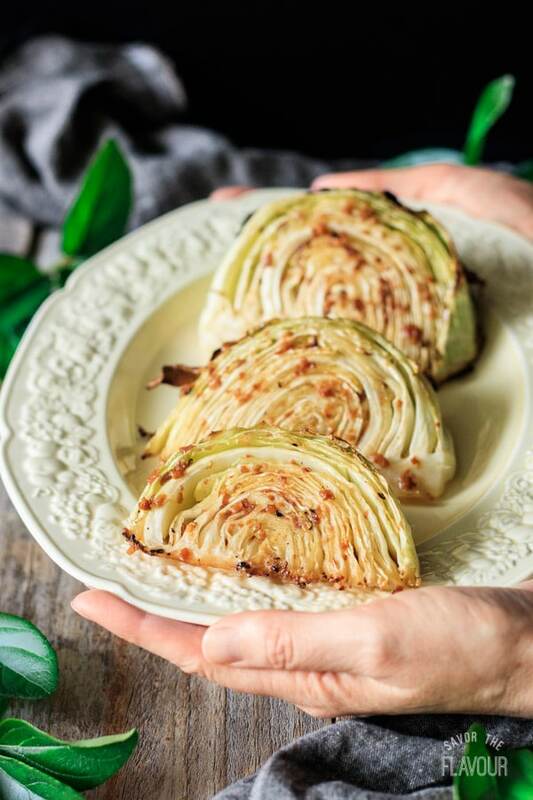 Roasted cabbage wedges are an easy healthy side dish you can serve for a low carb dinner. Simply use fresh green cabbage, garlic, lemon and butter. Enjoy the health benefits of this quick vegetarian recipe that can be roasted in the oven on one tray. 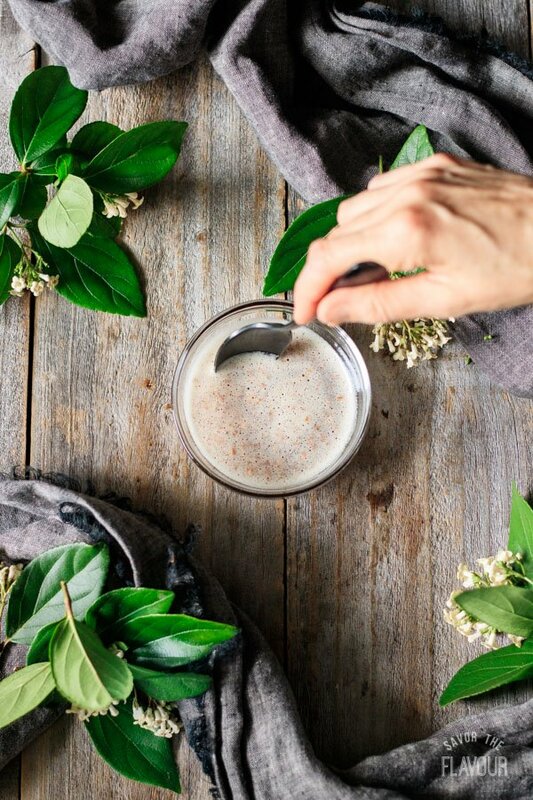 This recipe was originally published on February 22, 2018. Are you looking for an easy vegetable side dish? 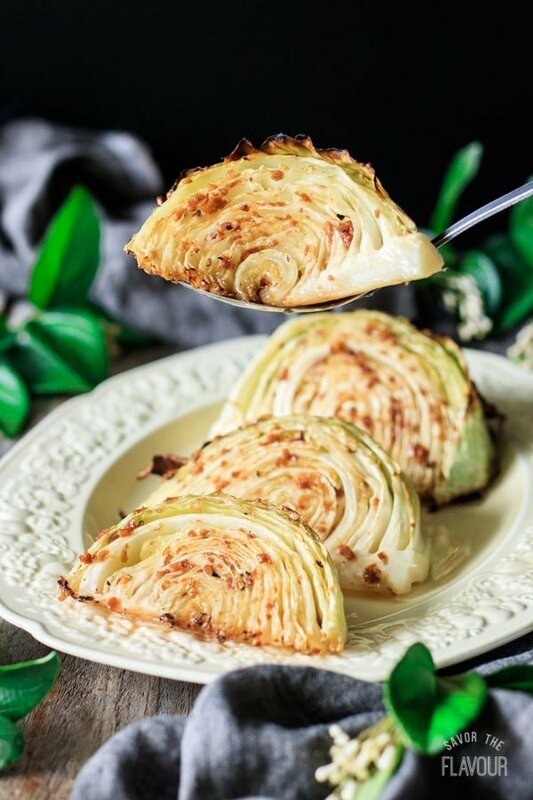 Roasted cabbage wedges served with lemon garlic butter is a terrific choice. 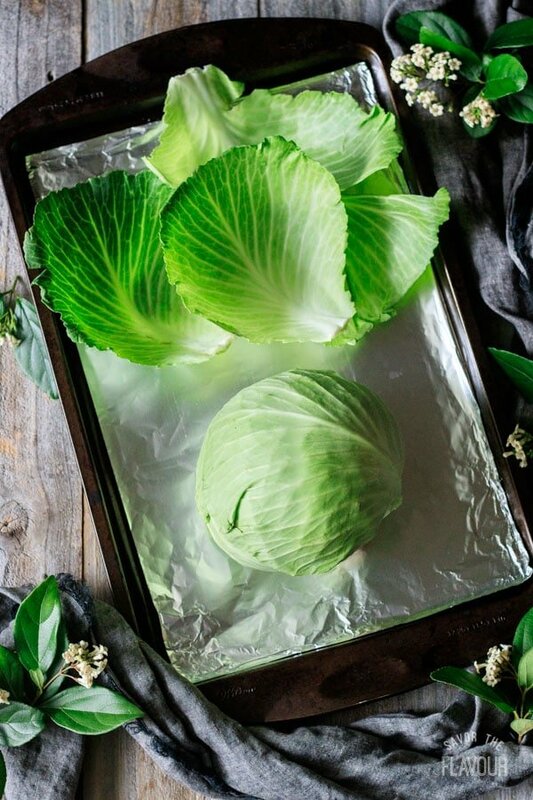 Cabbage is a vegetable that we all need to eat more of, but a lot of people don’t like it boiled. What’s the solution? Roasting it! When cabbage is roasted, it becomes sweeter and takes on a slightly nutty taste. Just brush on some olive oil and sprinkle on a bit of salt and pepper, and let your oven do the work. 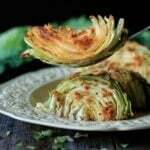 You can eat roasted cabbage plain or with a sauce, dressing or flavored butter drizzled on top. For this recipe, mince up some garlic and let it cook in butter until they both turn a golden brown. Next, add a splash of lemon juice and brush on the garlic brown butter. Now the humble cabbage wedge has just been elevated to an elegant side! Remove the loose, tough outer leaves. Cut from top to bottom, straight through the core. Place the cut side down on the chopping board. Make another cut through the core to quarter it. Repeat this cut to get 8 wedges. Keep the inner core on the wedges, as it helps the cabbage hold its shape while roasting. Is cabbage high in fiber? Yes, it is high in soluble fiber, as it is 87% water. The fiber in cabbage helps you feel full, making it a popular food choice for weight loss. 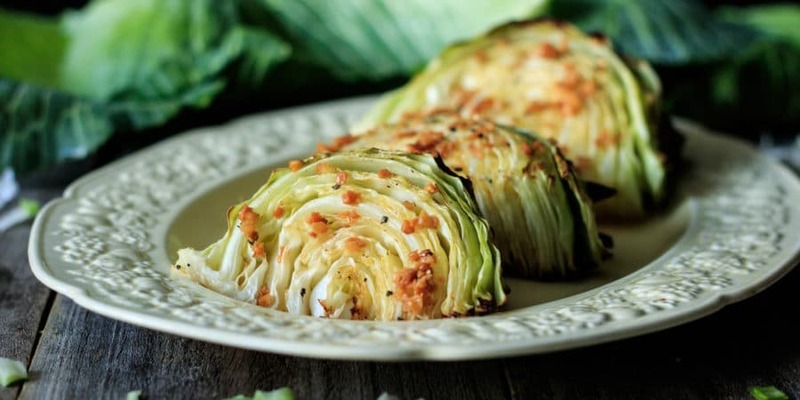 Do you have to use green cabbage for roasted cabbage wedges? No, feel free to use red cabbage or savoy cabbage. Since red cabbage is round and tightly compacted like green cabbage, it should cook similarly. How do you reheat cabbage wedges? In a 350 F oven for 10-15 minutes. Use a cast iron skillet, over medium low heat, for 3 minutes per side. 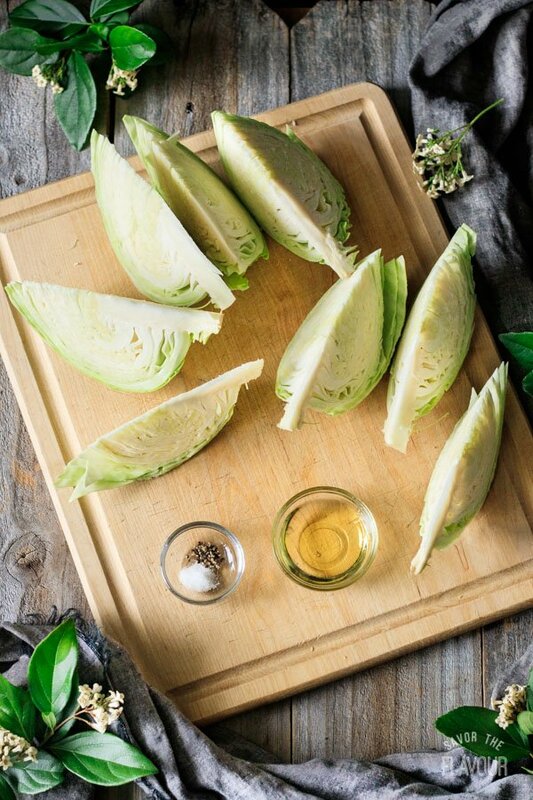 What do you eat with cabbage wedges? Remove the loose, tough outer leaves from the cabbage. Cut the cabbage into 8 wedges with a sharp knife, keeping the core intact. Gather the olive oil, salt, and pepper. 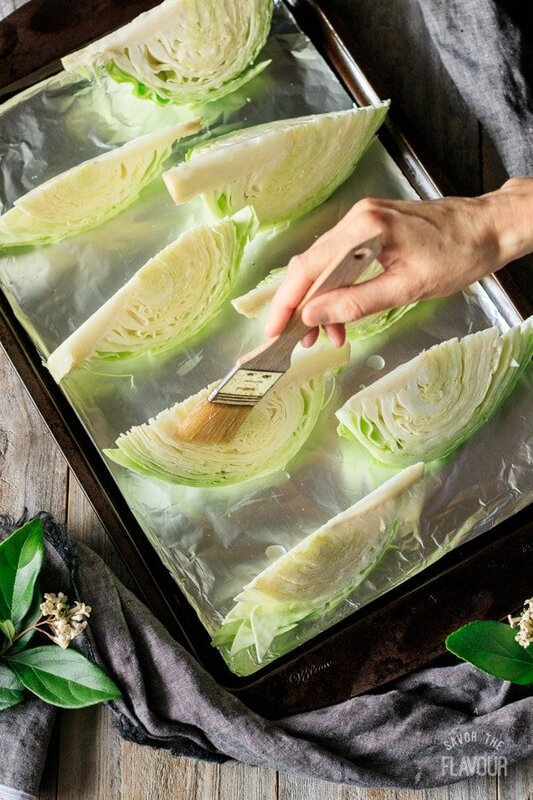 Line a baking tray with aluminum foil and brush both sides of the cabbage wedges with olive oil. Sprinkle on the salt and black pepper. Lay cut side down and roast for 15 minutes at 400 F. Remove from the oven and carefully flip the wedges over and roast for another 15 minutes, or until the outer edges are browned and crispy. 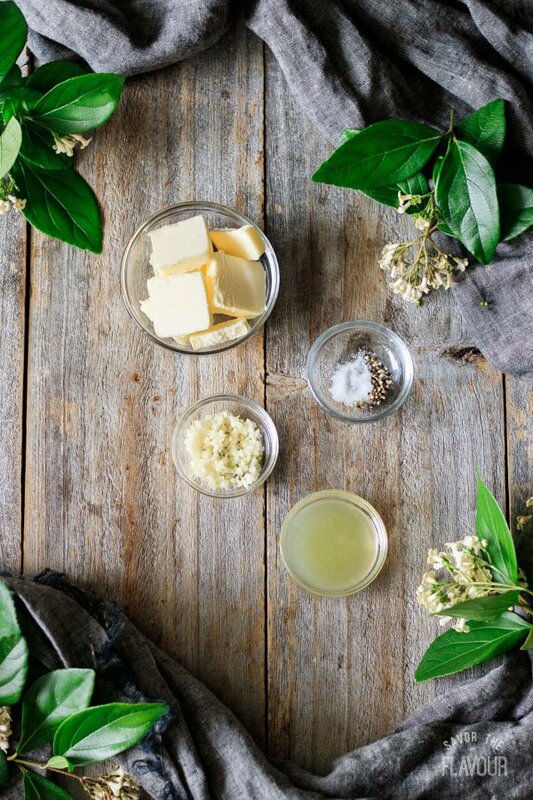 While the cabbage wedges are roasting, gather the ingredients for the lemon garlic butter. Melt the butter over medium high heat and add the minced garlic. Stir constantly until the butter and garlic turn a golden brown color. Remove from the heat and pour the browned butter and garlic into a small bowl. Pour in the freshly squeezed lemon juice and add a sprinkle or two of salt and pepper. Stir and adjust seasonings, if necessary. When the roasted cabbage wedges are still warm, brush the warm lemon garlic butter onto both sides of each wedge. Serve this warm alongside traditional Dublin coddle and you’ll have an Irish supper anyone would be thrilled to eat. Want this as the main course? Serve a cabbage roll tomato sauce over top with a side of rice. Want this as a base for a simple salad? Drizzle a mustard vinaigrette over top, and garnish with chopped green onion. Want to add some cheese as garnish? Try blue cheese, feta, or shaved parmesan. Want to add some nuts? Try walnuts or pine nuts. Want to add more spices? Try fennel seeds, celery seeds, coriander, mustard seeds, and caraway seeds. Don’t remove the core until after it’s cooked as it is helps the wedge keep it’s shape when you flip it. Roast on the middle rack in a hot 400 F oven. Hungry for more? 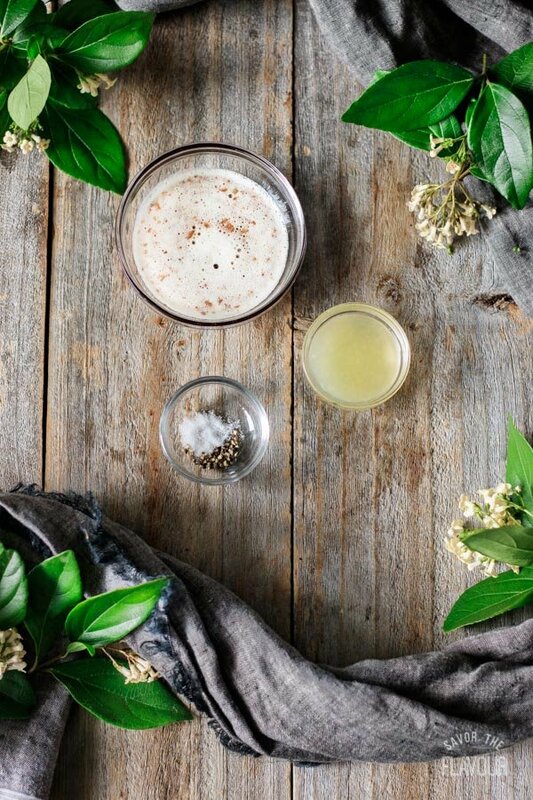 Check out these fantastic Irish recipes that will make your St. Patrick’s celebration a success! Traditional Dublin Coddle: a medley of sausage, bacon, onion, and potato in a flavorful broth. 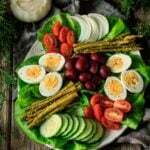 Irish Pub Salad: a refreshing blend of fresh and pickled veggies with homemade dressing. Traditional Irish Colcannon: a delicious take on mashed potatoes. The pleasure of a 5-star review of these roasted cabbage wedges would be greatly appreciated. Preheat the oven to 400 F. Line a large cookie sheet with foil. Take off the outer leaves from the green cabbage. Using a large knife, cut the cabbage in 8 pieces by cutting it in half, then in quarters, etc. Leave the stem and core on, as it helps the cabbage hold its shape. 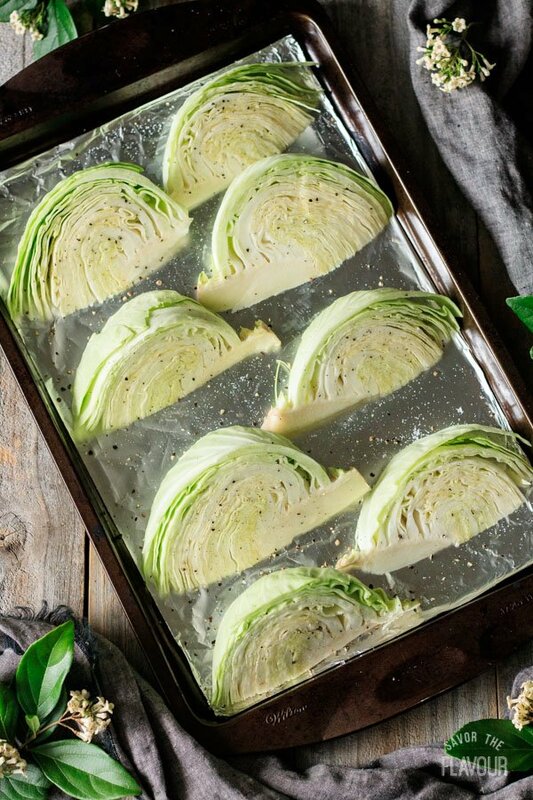 Place the cabbage on the foil-lined cookie sheet. Brush both sides with olive oil and sprinkle with salt and black pepper. Roast in the oven for 15 minutes, then carefully turn with a flipper and roast for another 15 minutes or until slightly brown around the edges. While the cabbage is roasting, mince the four cloves of garlic. 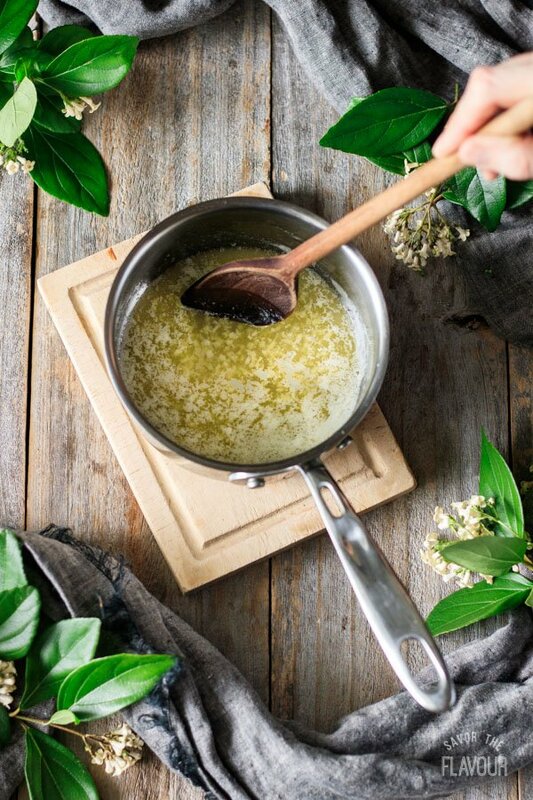 Melt 4 tablespoons of unsalted butter in a small saucepan over medium high heat. Add in the garlic. 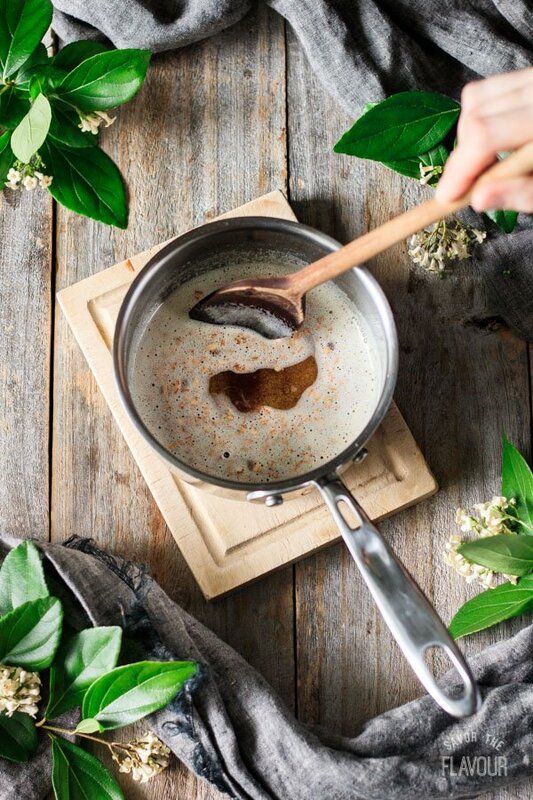 Constantly stir with a wooden spoon until the butter and garlic turns a golden brown. Stir in the freshly squeezed lemon juice and add a sprinkle of salt and pepper. Stir again and adjust seasonings to taste. 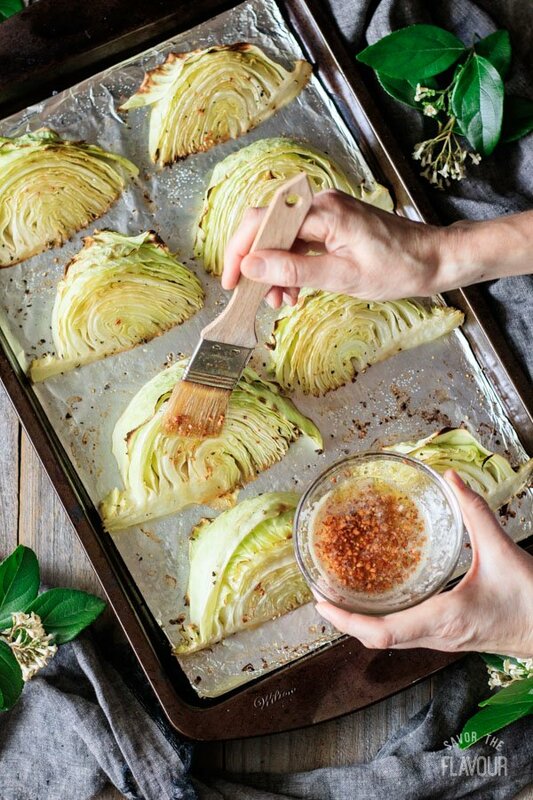 When the roasted cabbage is ready to serve, brush the lemon garlic butter onto each cabbage wedge. Serve warm with a bowl of Dublin coddle and boxty bread. If you need to speed up the cooking time for the cabbage, increase the oven to 450 F. Cooking time will be 10 minutes per side. My husband loved these. I even snuck a bite (don’t usually like cabbage) and then another! I was sick of the New England Boiled dinner sloppy cabbage with corned beef, so I decided to try something new. I didn’t brown the garlic butter, just melted everything in the microwave and then added the lemon before brushing it on the cabbage. The brown toasty bits were amazing. I might try pulling the cabbage apart and then roasting it so it is ALL brown and toasty-hahaha. Great recipe, thank you. We’re so glad that you and your husband enjoyed the cabbage wedges! Thanks for your kind words! Thanks for sharing! Do they keep well or better day of? The cabbage wedges taste best the same day. 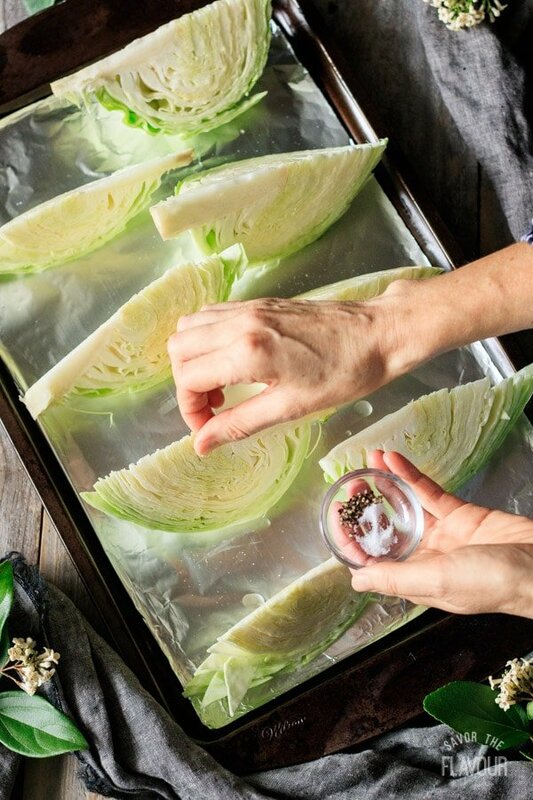 If you need to make it ahead of time, it’s best to prep all the ingredients and roast the cabbage right before you serve it. This looks delicious! 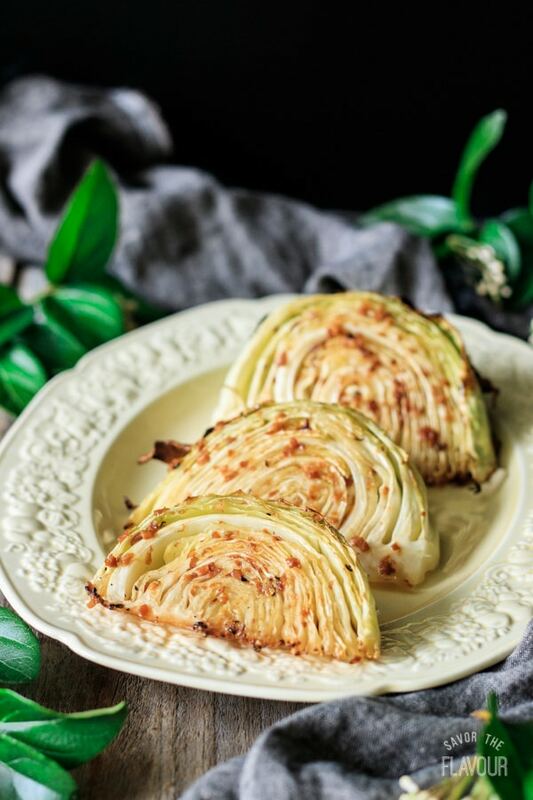 I want to incorporate cabbage more often, but it is difficult to find recipes that will be a crowd favorite. Cabbage is delicious! 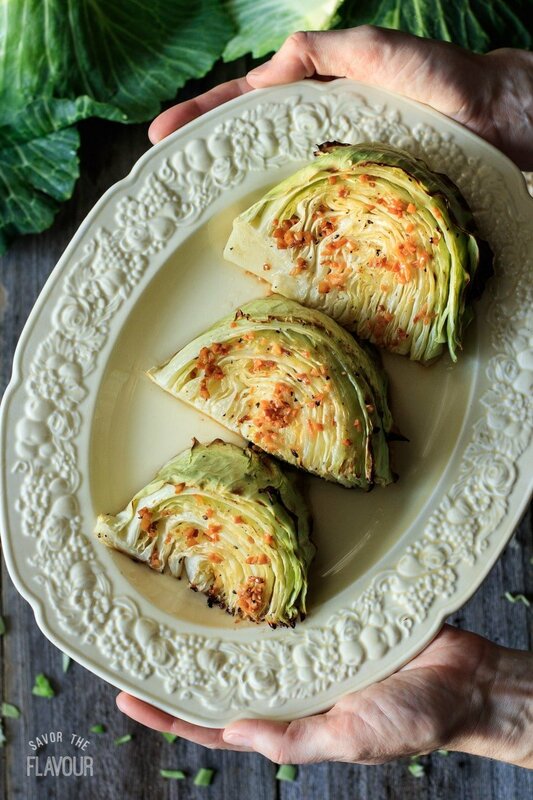 I hope you found these cabbage wedges to be a crowd favorite. This is a fantastic recipe. I make it several times a month. My husband and I are garlic lovers so I bump that up. Leftovers are used on sandwiches, tacos etc. We’re so glad to hear that you enjoy the cabbage wedges! It’s a great idea to use the leftovers on sandwiches and tacos. Thanks for leaving a review!